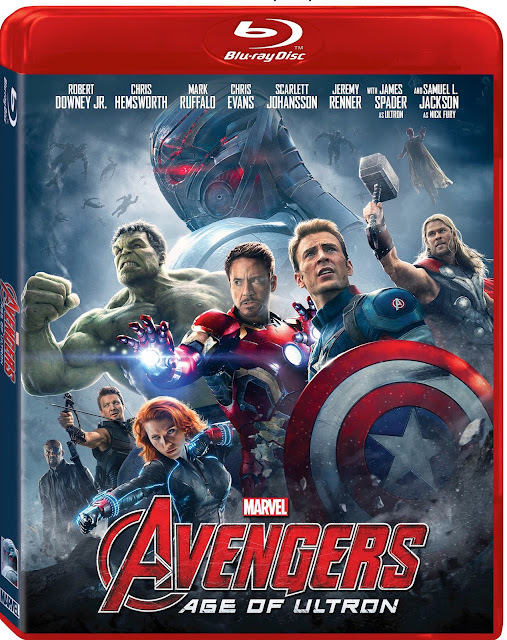 Marvel Studios reunites Earth’s Mightiest Heroes in the unprecedented movie event, Marvel’s Avengers: Age of Ultron. Iconic heroes are forced to reassemble and face their most intimidating enemy yet – ULTRON. Pushed to the brink of their physical and emotional limits, the team must recruit both new heroes and familiar allies to face an escalating danger that threatens the entire planet. SYNOPSIS: Marvel Studios unleashes the next global phenomenon in the Marvel Cinematic Universe: Marvel’s Avengers: Age of Ultron. Good intentions wreak havoc when Tony Stark (Robert Downey Jr.) unwittingly creates Ultron (James Spader), a terrifying A.I. monster who vows to achieve “world peace” via mass extinction. Now, Iron Man, Captain America (Chris Evans), Thor (Chris Hemsworth) and The Hulk (Mark Ruffalo)—alongside Black Widow (Scarlett Johansson), Hawkeye (Jeremy Renner) and Nick Fury (Samuel L. Jackson) —must reassemble to defeat Ultron and save mankind… if they can! This action-packed adventure is a must-own, mind-blowing blast! FEATURE RUN TIME: Approximately 141 min. Disney Movies Anywhere (DMA) is an engaging and family-friendly cloud-based digital movie service that makes it simple to buy your favorite Disney, Pixar and Marvel movies once and watch them anywhere. With DMA you can explore Disney’s library of over 400 eligible digital movies, discover hours of new and exclusive short-form content, and watch your digital movies from the comfort of the living room or across multiple mobile devices. In addition, you can redeem Digital Copy codes found in Disney, Pixar and Marvel Blu-rays and DVDs, as well as earn Disney Movie Rewards points with every digital purchase. Sign up and access Disney Movies Anywhere for free on DisneyMoviesAnywhere.com and through the Disney Movies Anywhere iOS and Android apps. Users can then simply connect their iTunes, Google Play and/or VUDUat VUDU.com/DMA accounts to begin enjoying their Disney, Pixar, and Marvel digital movie collections across platforms and devices. Marvel Studios presents “Avengers: Age of Ultron,” the epic follow-up to the biggest Super Hero movie of all time. When Tony Stark tries to jumpstart a dormant peacekeeping program, things go awry and Earth’s Mightiest Heroes, including Iron Man, Captain America, Thor, The Incredible Hulk, Black Widow and Hawkeye, are put to the ultimate test as the fate of the planet hangs in the balance. As the villainous Ultron emerges, it is up to The Avengers to stop him from enacting his terrible plans, and soon uneasy alliances and unexpected action pave the way for an epic and unique global adventure. Marvel’s “Avengers: Age of Ultron” stars Robert Downey Jr., who returns as Iron Man, along with Chris Hemsworth as Thor, Mark Ruffalo as Hulk and Chris Evans as Captain America. Together with Scarlett Johansson as Black Widow and Jeremy Renner as Hawkeye, and with the additional support of Don Cheadle as James Rhodes/War Machine, Cobie Smulders as Agent Maria Hill, Stellan Skarsgård as Erik Selvig and Samuel L. Jackson as Nick Fury, the team must reassemble to defeat James Spader as Ultron, a terrifying technological villain hell-bent on human extinction. Along the way, they confront two mysterious and powerful newcomers, Pietro Maximoff, played by Aaron Taylor-Johnson, and Wanda Maximoff, played by Elizabeth Olsen and meet an old friend in a new form when Paul Bettany becomes Vision. Written and directed by Joss Whedon and produced by Kevin Feige, p.g.a., Marvel’s “Avengers: Age of Ultron” is based on the ever-popular Marvel comic book series “The Avengers,” first published in 1963. Louis D’Esposito, Alan Fine, Victoria Alonso, Jeremy Latcham, Patricia Whitcher, Stan Lee and Jon Favreau served as executive producers. Marvel’s “Avengers: Age of Ultron” opened in U.S. theaters on May 1, 2015. For over 90 years, The Walt Disney Studios has been the foundation on which The Walt Disney Company was built. Today, the Studio brings quality movies, music and stage plays to consumers throughout the world. Feature films are released under the following banners: Disney, including Walt Disney Animation Studios and Pixar Animation Studios; Disneynature; Marvel Studios; Lucasfilm; and Touchstone Pictures, the banner under which live-action films from DreamWorks Studios are distributed. The Disney Music Group encompasses the Walt Disney Records and Hollywood Records labels, as well as Disney Music Publishing. The Disney Theatrical Group produces and licenses live events, including Disney on Broadway, Disney On Ice and Disney Live!. Marvel's Ant-Man Poster...in LEGO bricks!